ABSTRACT—A crystalline efflorescence, which appears primarily on pre-19th-c. Leather bindings in the University of Chicago Library, Department of Special Collections, was analyzed by Nuclear Magnetic Resonance to be lactic acid salts. The author speculates that potassium lactate used on volumes 25 years ago might be related to this condition. A WHITISH BLOOM on some of the pre-1850 leather bound volumes in the Department of Special Collections of the Joseph Regenstein Library (University of Chicago) has been observed over the past two years. A survey of the stacks revealed books in scattered locations exhibiting this deposit, with a greater incidence in the general vicinity of one or two of the air conditioning ducts. Sheepskin bindings and other older porous leathers showed the heaviest concentration of what appeared to be crystals, mostly on volumes that had been treated with potassium lactate and neats-foot oil/lanolin within the past twenty-five years. The efflorescence seemed to “travel” from one volume to the next, though it affected only old tanned leathers and seldom if ever appeared on vellum, cloth, or paper. The surfaces exposed to the air (such as backbones) were those most densely coated with the bloom (Fig. 1). Fig. 1. Volumes showing the white crystals. what is the composition of this crystalline deposit? is it in itself damaging to leather? can it be controlled, and if so, how? Microscopic examination of scrapings taken from afflicted books ruled out mold, and established that the crystals resembled—and almost certainly were—salts. To analyze and identify the substance, proton Nuclear Magnetic Resonance spectra aqueous solutions (D2O) of scrapings from leather backbones of ten books were recorded at 500 MHz. The reference shown in Fig. 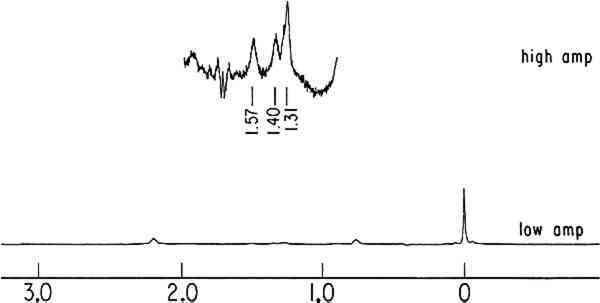 2, the NMR spectrum of lactic acid, may be compared to literature on the subject.1 Three weak resonances were observed in the samples at δ1.3., δ1.40, and δ1.57 (Fig. 3). These signals may be assigned to the methyl resonances in lactic acid and its polymers, formed in aqueous solution. Other weak resonances, observed between δ4.3 and δ5.3, may be assigned to the corresponding methine hydrogen atoms. The white efflorescence dissolved in water, and only the hydrogens of lactic acid were observed in the samples examined. Fig. 2. NMR spectrum of lactic acid. Fig. 3. 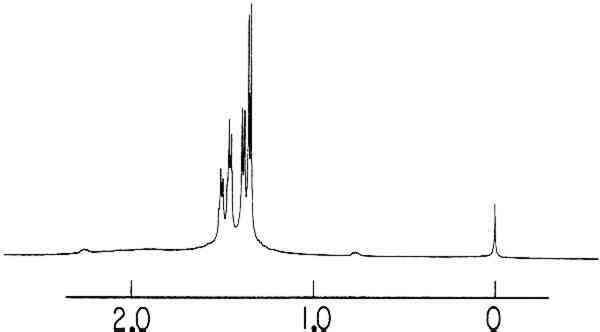 NMR spectrum of scrapings from leather bound volume. the lactates identified in these samples appear to be residues of some substance introduced into or onto the leather (e.g., potassium lactate). Several questions remain to be answered, however. Are other substances, known to cause or encourage bloom, also likely to be present here? Leather dressings containing certain waxes have been implicated in outbreaks of bloom.4 There is no record to establish that any of these were applied to volumes in the Regenstein Library, however. More observation and research must be done to determine whether, in response to atmospheric changes, the crystals can “disappear” as readily as they appear. Do they recur when they have been wiped off the surface? If so, how long does it take for them to redevelop? If the occurrence of bloom is an irreversible process, does it signal deterioration of the leather fibres? Finally, has this condition been observed in other libraries? Proton Nuclear Magnetic Resonance permits the identification of the different kinds of hydrogen nuclei in organic molecules. Such identification can be unique. See The Aldrich Library of Nuclear Magnetic Resonance Spectra, Vol. 2, p. 170. Milwaukee: The Aldrich Chemical Co., Inc., 1974–75 for the spectrum of lactic acid, and a variety of other organic acids. See R.Reed, Ancient Skins, Parchments, and Leathers, p. 60 ff. London and New York: Seminar Press, 1972. The practice of making pencilled notation of date of treatment in each volume was apparently abandoned by 1970, and no record of the nature, extent, or frequency of treatments after that date has come to light. See The Abbey Newsletter, Oct. 1982, p. 59. The author wishes to thank Dr. Leon Stock, Professor in the Department of Chemistry of the University of Chicago, and Dr. John Rippon, Department of Medicine and Director of the University's Mycology Service Laboratory, for the help and information they gave so generously. 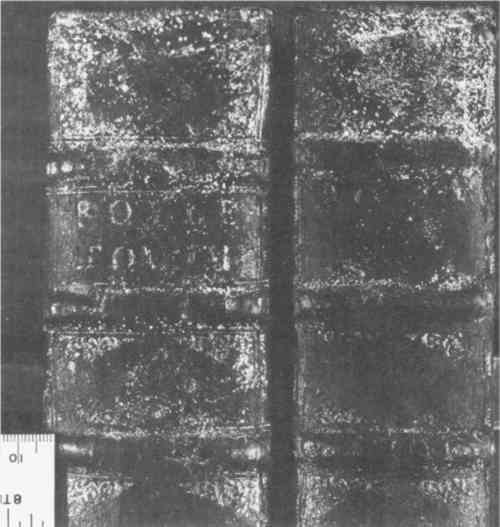 Dr. Rippon's microscopic examination of scrapings from the leather backbones of books culminated in a brief but informative lecture on mold in its several forms, thus marshalling the evidence that ruled out mold in this case. Dr. Stock, who then interested himself in the challenge of identifying the bloom, determined that the NMR spectrum was the most accurate and effective means of identifying the substance. He arranged for the tests to be run, analyzed the results, and explained and interpreted his findings to the author. His guidance and continuing interest, and his gift of teaching, so that a complex subject became comprehensible to a lay person, are all here gratefully acknowledged.